2010 Year Of Blankets video is now live! See past videos on YouTube. 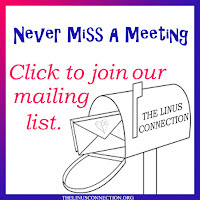 The Linus Connection meets the third Saturday of each month at St. Philip's Methodist Church, 16321 Great Oaks Drive (the parking lot is off Racine), Round Rock, Texas 78681-3659. The meetings run from 9 am - 11 am, with Show & Tell happening at 10 am. Demos follow. 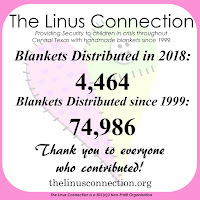 We now have updated blanket specifications that take into account the needs of our recipient facilities in addition to the types of blankets we receive. The guidelines includes quilts, quilt tops, yarn blankets and fleece. Save the date, the next Linus Work Day at Honey Bee Quilt Store will be Saturday, January 8, 1 - 4 pm. Please note the change in time from our usual Work Days. Bring your sewing machine and a friend, quilt kits will be provided! Honey Bee Quilt Store is currently selling a special fabric just for making Linus blocks! Buy a fat quarter and use that fabric to make as many 12 1/2" blocks as you like. Turn the blocks in to Honey Bee by Monday, February 14. 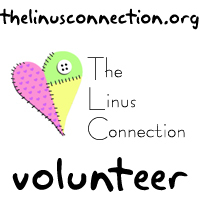 The blocks will then be distributed to Linus volunteers to turn into quilt tops. The fabric is available in-store only. Stop by or call the store for details. Photos of completed quilts will be posted online. The brand new Linus Library will be up and running in January 2011! There will be a list of books online with an easy form you can use to request books from the library. There will be more information with complete instructions in January. Every month, quilts and afghans catch the eyes of volunteers that would like to try the pattern themselves. This month, a big favorite back in the sorting area was a granny ripple afghan. There are two free versions online. 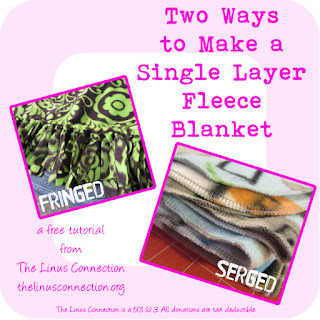 This one from Project Linus and this one from Lyn's Designs. We would also like to encourage everyone to visit Bonnie Hunter's website Quiltville. If you scroll down a bit and look on the right hand side of the page, you will find oodles of free patterns that are perfect for using up all those scraps! If you'd like share a demonstration with us at monthly meeting, please contact Jennifer to be added to the calendar. Demos take place at each meeting after Show & Tell. 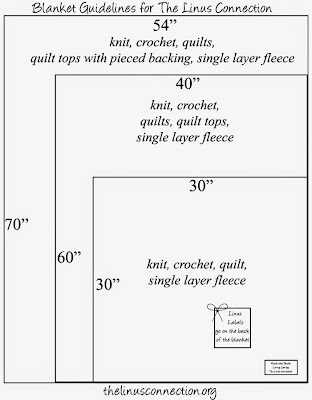 January Demo will be Wickedly Easy with Sharon W.
February Demo will be Scrappy Six Patch with Sharon K. Sharon requests that volunteers please bring in 5 1/2" x 7 1/2" cut pieces to help make kits to go along with her demo. We are still collecting crayon blocks to provide to youth groups and school children. Blocks need to be made with an 8 1/2" square of muslin with 2 1/2" matching sashing. Please iron a piece of freezer paper on the back of the muslin to make it easier for the children to color. Please bring finished blocks to the next meeting. Blankets were shown and donated on December 18, 2010. They are not necessarily being shown by the person that made them. We encourage you to join us at our monthly meeting and participate in Show and Tell at 10 a.m. A free demo follows. Gattis Elementary students donated 12 fleece blankets. They meet after school and are learning to sew.